Travel on the Downeaster from Boston to Brunswick, ME and your local transfer will take you to Bar Harbor adjacent to Acadia National Park. Overnight in Bar Harbor for two-nights and enjoy the downtown area plus a tour or Acadia National Park. After leaving Bar Harbor, you will take the CAT to Yarmouth, Nova Scotia and transfer to Trout Point Lodge where you will have time to explore the resort and all it has to offer. Enjoy a guided hike or various other resort activities; there are so many options you will want to try them all! Spend 2 nights at the Trout Point Lodge. The following day transfer from Trout Point Lodge to Yarmouth to board the CAT ferry. Arrive in Bar Harbor that afternoon and transfer to Portland, ME for an overnight stay before departing for Boston the final day. 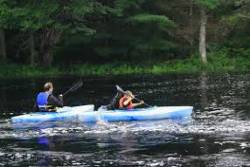 From canoeing and kayaking to star-gazing and hiking, leave your worries behind you and immerse yourself in this retreat into the Nova Scotia Wilderness. An unparalleled place for relaxation & enjoyment of the outdoors, this 5-star inn's 100 acre wooded estate borders the remote Tobeatic Wilderness Area & the pristine waters of the scenic Tusket & Napier Rivers. Enjoy canoeing & kayaking, star gazing, geo-tours, forest bathing, cooking classes, an outdoor barrel sauna & wood-fired hot tub, swimming refreshing river water, hiking trails, & nature walks amidst wilderness splendour. Trout Point Lodge of Nova Scotia selected as the world's first certified Starlight Hotel by the UNESCO partner Starlight Foundation! *Overnight rates are per person based on Double occupancy and are subject to availability at the time of booking. This package can be customized if you would like extra time at the Trout Point Lodge.The last night in Portland is optional. The CAT ferry arrives at 12:00PM. You can catch a flight or take the train home or stay and relax in Portland for the evening. Price will adjust as you make changes to the itinerary. The CAT Ferry operates from June 21 until October 15, 2019.